Care Quest is a senior placement agency in Contra Costa County that assists elders in finding residential care including assisted living facilities and board and care homes. The web server used by Carequest.us is run by Internet Planners LLC and is located in Lansing, USA. On this web server 55 other websites are hosted. The language of those websites is mostly english. 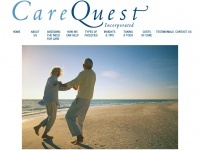 A Apache server hosts the websites of Carequest.us. The website does not specify details about the inclusion of its content in search engines. For this reason the content will be included by search engines.